We often see that, persons with disability needs to use mobility car.Mobility Car is a vehicle issued to a disabled person, to allow them to travel without burden of their disability. Mobility cars are obtained from a scheme called “Motability”. But this car too not come with some preconditions and these conditions are difficult to met for severely disabled person.Moreover, driving a car is always difficult for a person with having control distributed all over. We want to build a car which can be operated by using joystick. If we can build that, it would be great help for disabled persons. Why we need this type of system? Existing system in the market are modified to allow the physically disabled to drive but it still needs lots of improvements. 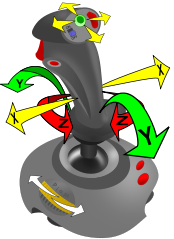 1) Joystick:- A joystick is an input device consisting of a stick that pivots on a base and reports its angle or direction to the device it is controlling. We will take input from user through a joystick and then process it to produce servo commands via a Arduino Board. 2) Autonomous driving in constrained environment: Using input from Kinect sensor.Kinect is a motion sensing input device by Microsoft for the Xbox 360 video game console and Windows PCs to obtain depth image and process the frames in real-time.To perform depth based blob detection combining it with vision based blob tracking to perform a robust obstacle detection. The technique involves using a slice of depth image for detecting obstacles and then finding path taking in view the maximum steering angle, width of the vehicle, turning radius etc. Hardware includes – Standard Laptop (Intel core i5-2410M @ 2.30 GHZ, 4GB RAM), Joystick, Kinect Sensor, Arduino Uno Microcontroller, Servo, UPS, Battery, servo motors, h-bridges and wireless transmitter and receiver(Fail safe) . The vehicle also has a fail-safe mechanism that is used to control vehicle in emergency using a wireless remote.